The Woolworth’s story reflects the social changes that were taking place in the lives of ordinary people: new shopping habits, new career and employment opportunities, and the life-long friendships for the staff. Taking each decade in turn, the narrative examines the lives of the people who worked for Woolworths, the products they sold, and the competition they faced. F.W. Woolworth & Co. Ltd opened their first Irish outlet in Grafton Street in 1914. Twelve months later, a second branch was launched in Belfast’s High Street. In the ensuing decades, almost 40 more stores were established. For generations of Irish shoppers, a visit to their nearest Woolworths store was regarded as an essential part of a day’s outing. 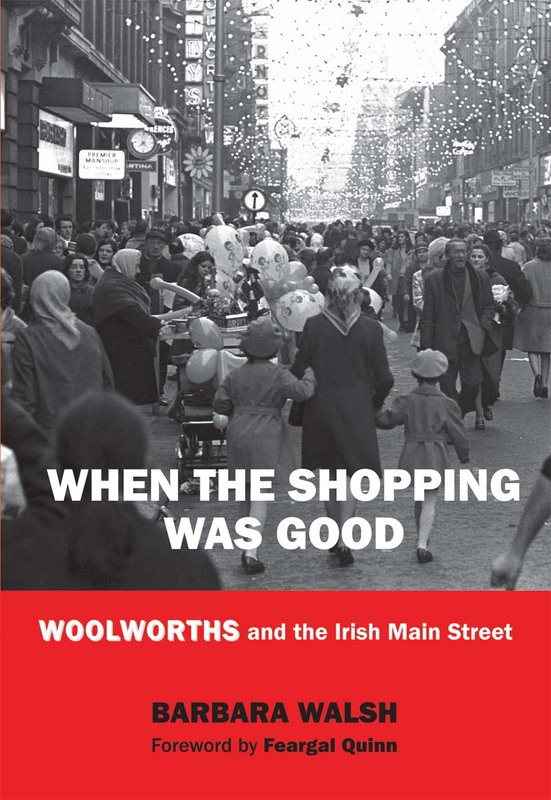 When the Shopping was Good presents a lively and entertaining account of this distinctive chain’s retailing style in Ireland. The Woolworth’s story reflects the social changes that were taking place in the lives of ordinary people: new shopping habits, new career and employment opportunities, and the life-long friendships for the staff. Taking each decade in turn, the narrative examines the lives of the people who worked for Woolworths, the products they sold, and the competition they faced. Turbulent times in the 1920s and 1930s, the domestic political situation, two world wars, and subsequent shaking up of the retail scene in the 1960s and 1970s provide the backdrop to a world now gone. Appendix IV: Map of Stores, 1969. Author and historian Dr Barbara Walsh is a graduate of Lancaster University History Department in the United Kingdom. She is the author of Roman Catholic Nuns in England and Wales, 1800-1937 (IAP, 2002) and Forgotten Aviator Hubert Latham: A High-Flying Gentleman (Tempus, 2007).